A short scar facelift redefines the jaw line by lifting and smoothing out the sagging jowl. This is an extremely popular procedure, which refreshes the face, improves the contour and removes the heavy tired look. The Short Scar Facelift is a new alternative facelift technique that is used to reposition and tighten skin and tissue in and around to face as opposed to doing the same with the help of traditional facelift techniques. This is a newly developed technique that helps limit the amount of scarring and improves the recovery time of facial rejuvenation techniques. In a short scar facelift, the incision is made in front of the ear and doesn’t go behind the ear and into the hairline like other facelift incisions. Hence, it has the advantage of a quicker recovery with minimal scarring and swelling. Unlike with other types of facelifts, the short scar lift incision does not extend behind the ear. Your surgeon can still re-suspend the tissues that support your smile lines and jowls and tighten a moderate amount of your loose skin. Due to the fact that the incision is smaller and has to be made more accurately, this is a challenging procedure for a cosmetic surgeon and must be performed with care. Equipped with unparalleled knowledge of the underlying structures of the face and vast experience in dealing with delicate facial nerve, the expertise of Dr. Milan Doshi makes Allure MedSpa one of the most favoured destinations of patients seeking Face Lift from all over the world. The short scar facelift is carried out under general anesthetic and an overnight stay in hospital is usually required. Occasionally procedures can sometimes be carried out under a local anesthetic and sedation. Short scar face lift patients usually take a few days to a week off work. Most people look good within a few days, with most swelling gone by 2-3 weeks. Allure MedSpa which is renowned for its state-of-the-art internationally acclaimed services, offers affordable and cost effective cosmetic procedures. To know more about the cost of your procedure request a consult by filling the form below. Your consultation is your chance to ask questions about Face Lift and put your mind at rest. Your surgeon will be able to offer you full explanations and answers to all of your queries. Candidates for a mini face lift, short scar face lift or traditional face lift can be as young as in their 30's, or well into their 70's and beyond. Bandages are removed the morning after the surgery. Over the subsequent few days, you can gently wash your hair with a mild shampoo, obviously exercising care in the suture area. It is advisable not to apply any strong chemicals (bleach, ammonia etc) for four weeks following surgery. Bruising, swelling and numbness are temporary following a facelift and are mostly resolved after two weeks. The results of this facelift can last for years, and even when lines and wrinkles do start to appear, you may still enjoy a more contoured and defined face for life. 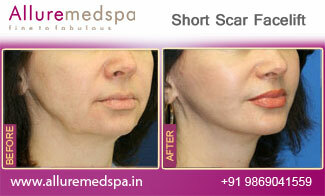 What is the similarity and difference between Short scar lift and Mini Lift? 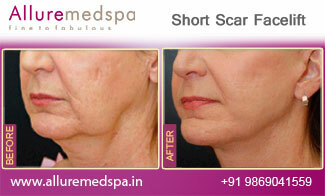 The incision for a short scar face lift is similar to that of a mini face lift. The difference in the two procedures is that, in a short scar lift, muscles and fat are elevated and secured in a more youthful position. Then surface skin can be lifted and re-draped with minimal tension. Patients see marked improvement in cheek laxity and improvement in the jowls and neck with both techniques.